Living in Oregon, we are blessed with an assortment of growing berries. So along with all the fruit trees and gardens, we’ve planted strawberries, gooseberries, blueberries, and raspberries. Our strawberries are well into their harvest, and we’ve enjoyed making lots of jam. We’ve enjoyed strawberries for a few years now, but this will be our first year to harvest gooseberries, raspberries and blueberries. 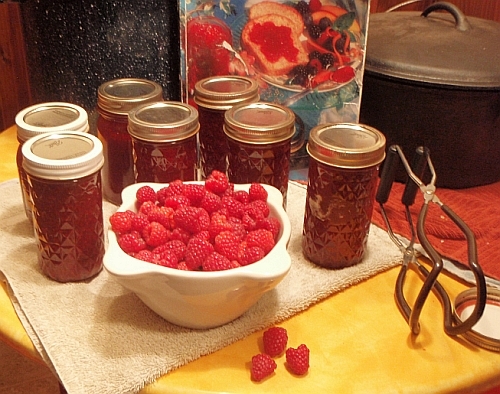 Our raspberries have finally ripened and now we boast some fresh jars of raspberry jam. (A little on the thin side, but no one here is complaining.) Raspberries prefer full sunlight and grow best in well-drained, sandy loam soils rich in organic matter. I’ve learned that the leaves can be used fresh or dried in herbal and medicinal teas. We are finding more raspberries ripening over time. This last batch that we’ve picked will go into the freezer. I’ve placed them on a tray, keeping the berries separate. After they freeze solid, I’ll place them into a zipper bag to enjoy mid-winter. Raspberries contain significant amounts of antioxidants such as anthocyanin pigments linked to potential health protection against several human diseases. The aggregate fruit structure contributes to its nutritional value, as it increases the proportion of dietary fibre, placing it among plant foods with the highest fibre contents known, up to 20% fibre per total weight. Raspberries are a rich source of vitamin C, with 30 mg per serving of 1 cup (about 50% daily value), manganese (about 60% daily value) and dietary fibre (30% daily value). 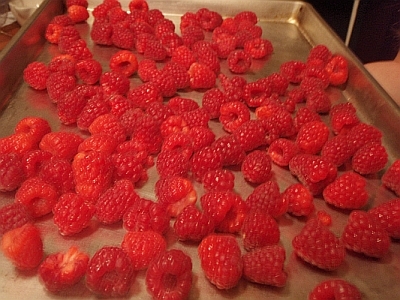 Contents of B vitamins 1-3, folic acid, magnesium, copper and iron are considerable in raspberries. Raspberries rank near the top of all fruits for antioxidant strength, particularly due to their dense contents of ellagic acid (from ellagotannins, see for instance raspberry ellagitannin), quercetin, gallic acid, anthocyanins, cyanidins, pelargonidins, catechins, kaempferol and salicylic acid. Yellow raspberries and others with pale-coloured fruits are lower in anthocyanins.